HOW DO YOU BECOME REPLAY PREMIUM FRIEND? If you are a JUST FOR FRIENDS member, you can get the upgrade and become PREMIUM by purchasing at least 3,000 € in the last year of your enrolment. If you are not part of our fidelity program you have the chance to become PREMIUM by purchasing at least 3,000 € in one receipt. 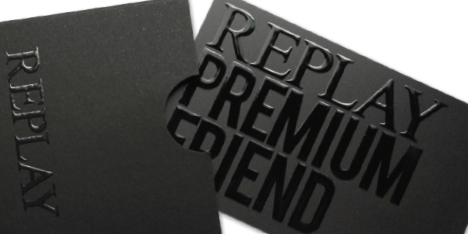 The REPLAY PREMIUM FRIENDS CLUB rewards you with an exclusive and elegant card that we will send you directly at home (or any address you will suggest to our store staff)! This card entitles you to a 15% off on every next purchase you make in any REPLAY STORE listed here below! Furthermore, REPLAY celebrates your birthday! Purchasing on your birthday, you will receive 20% discount as our gift. The membership to REPLAY PREMIUM FRIEND CLUB doesn’t downgrade: once you achieve the status of PREMIUM FRIEND, it lasts FOREVER! Visit us and discover more about the REPLAY PREMIUM FRIENDS CLUB! BE A FRIEND, BUT BE A PREMIUM ONE! This activity is not applicable on sale discounts and promotions. Fashion Box Spa reserves the right to amend or waive these terms and conditions at anytime.